your natural sweetener may become healthier and a little cheaper. The Food Technology Department of the Lakshmi Narayan Institute of Technology, Nagpur, has devised a method to prepare a water-based extract of stevia, a small bushy herb that yields natural sweetener stevioside. The technology involves boiling the leaves in water and collection of extract from the steam. D K Kawadkar, who led the research team and plans to patent the technique, said the extract remains stable without using chemicals and could be stored for two months without refrigeration. The water-based extract had no side-effects unlike the ethanol-based extract currently in use, he said. Also, the water-based extract is better assimilated by the body. The use of water will bring down the processing cost of the stevia extract by about 90 per cent. But its retail price (Rs 115 for 50 ml) will come down by only 7-8 per cent, according to Veena Deoke, owner of Victory Herbals and Aromatics, a Nagpur-based firm that plans to launch the new extract in the market in two months. 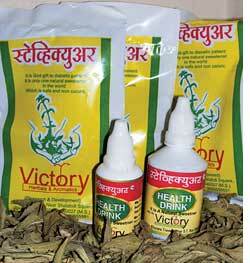 Victory Herbals is involved in stevia cultivation in Maharashtra. Kawadkar said the department had prepared pills and biscuits using the stevia extract, which could be consumed by diabetics, patients of high blood pressure and the fitness conscious. The department is now working on crystallizing the stevia extract into a sugar look-alike. Such a preparation, he said, would facilitate widespread use of stevia and its cultivation would become a profitable option for Vidarbha farmers. A native of Paraguay in South America, stevia has been in use as a healthy substitute for sugar in Japan and China for 60-odd years.